It's Beer Can Appreciation Day, y'all! ...I thought this would make the perfect excuse to try that funky recipe that makes not only beer, but the humble can itself, the true star of the process. 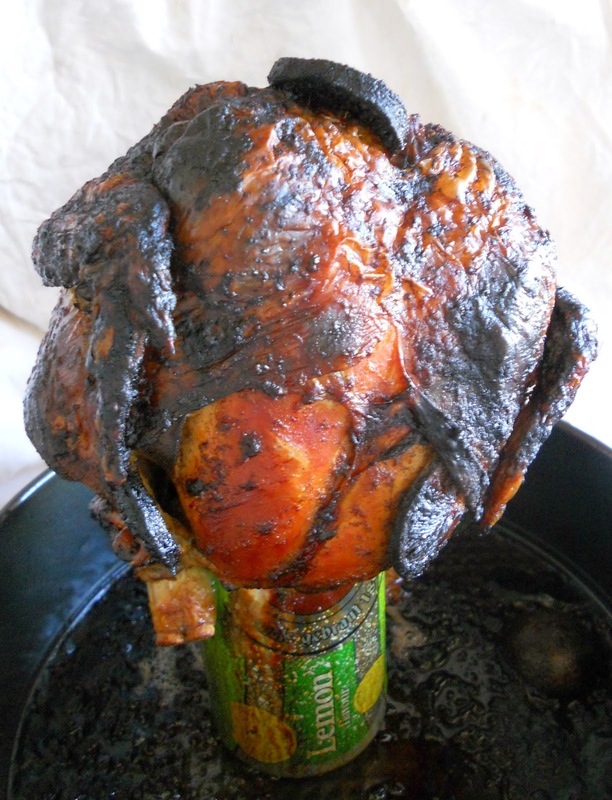 And yes, I'm talking about Beer Can Chicken - or, as the most baffling of YouTubers would say, "il pollo con la birra nel culo". Uh... please don't bother Google-translating that. Now even if you don't speak Italian (and, believe me, in this particular instance you're better off not understanding a word of it), the video should give you a fairly good idea of how it's done. In the end, though, I ended up picking this recipe - from How Sweet It Is once again, big surprise - which is a lot easier, and doesn't require a syringe... nor veggies. Ewww, veggies. As you can see, I used a Radler-type thingie (for the tee-totalers out there: that would be a lemon-flavoured beer) that I would never ever drink, but actually works fine with the citrus slices in this recipe. 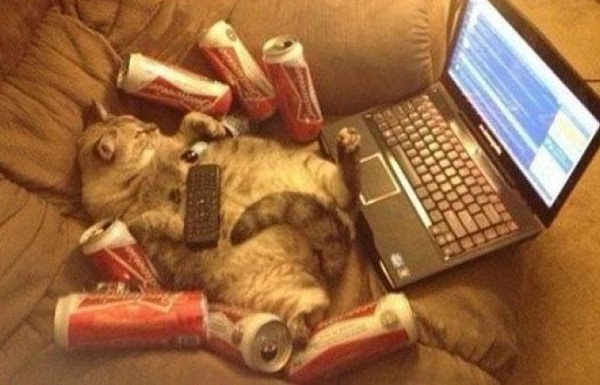 Taste aside, it was one of those slim, high cans and as such it was a perfect choice for the job at hand. The chicken ended up wonderful, with crispy, slightly spicy skin and incredibly tender and juicy meat (although, let's be honest, the skin is what you should be excited about if you're at all human). I know, many of you will be too grossed out by the idea of putting a beer can "up there", be it because of that horrific urban legend about the guy who died by drinking from a can that was contaminated by rat pee, or beacause you're worried about the can itself releasing chemicals in your food. Needless to say, I washed the can with the utmost care before the, ah, insertion. As for the possibility that the print on the can might be harmful... I'm no chemist, but I'm not that concerned tbh. 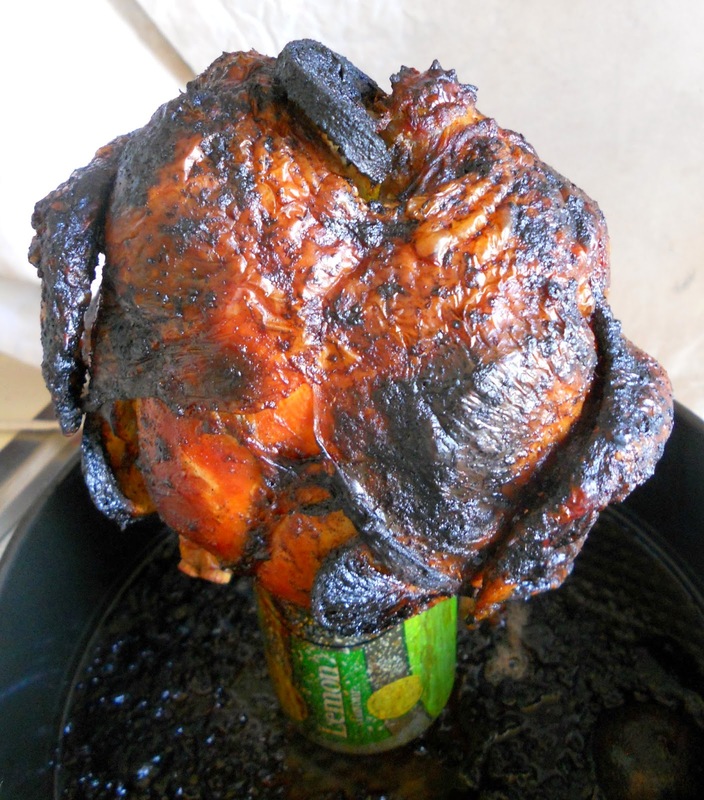 So many people have done this and survived, and I'm not going to eat beer can chicken every day, either. In the end, of course, it's going to be your call. But if you're willing to push out of your comfort zone a little, give this thing a try. It's awesome! I'll be honest: even now I can't look at the pics in this post without thinking of such choice pearls of SF as Ed Bryant's Dancing Chickens, or Snuff Movie by Nicoletta Vallorani. So... yeah, I had my doubts too, but in all honesty the chicken turned out so perfect that this recipe's a keeper. 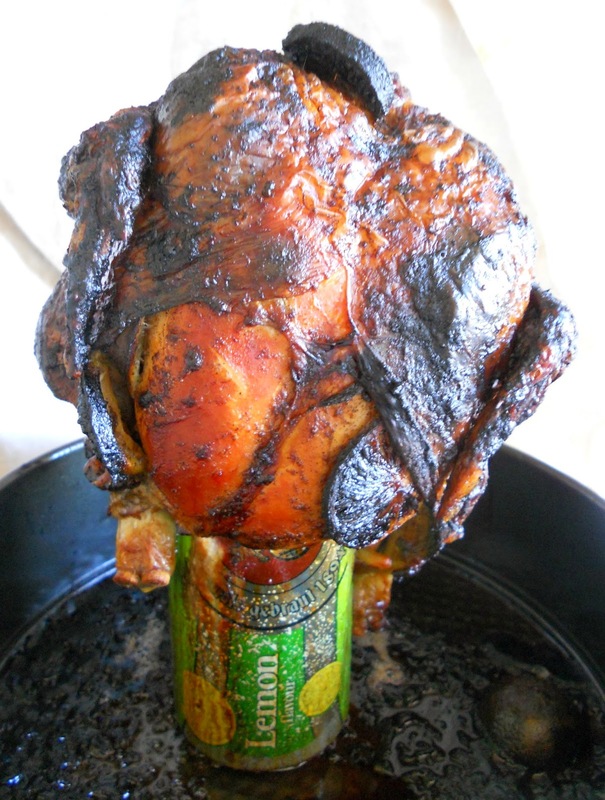 I think children would love it as well, since I remember how dryness was my main issue with poultry as a kid, and the beer makes even the breast meat really tender. Oh, and one last word of advice: remember Murphy's Law is at work, always. Meaning: no matter what you do, the chicken will want to topple. Place your can in an old pan, and place the pan on a larger sheet pan - you definitely don't want your oven flooded with beer and bird grease! 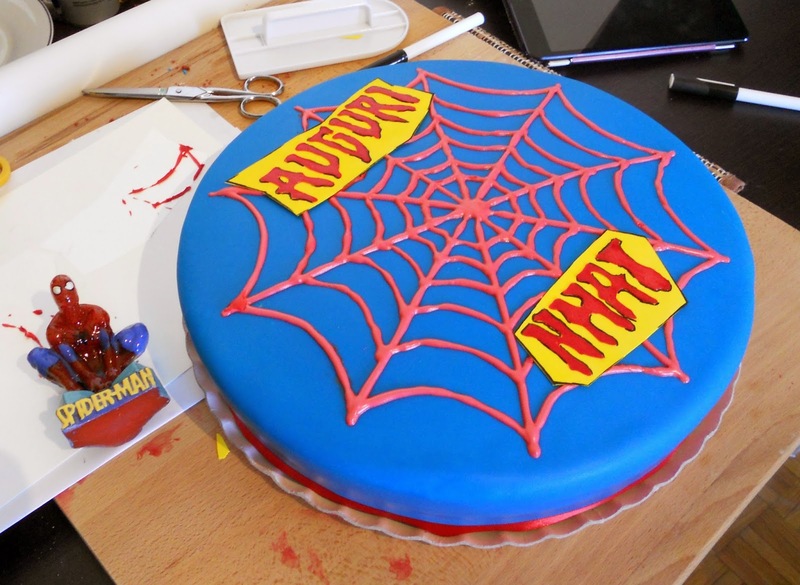 ...as I've been told at last that the Spider-Man cake I've been fretting about over the last two days survived a whole night in the office's makeshift fridge, a bumpy hour-long car trip to Arona, and the heat of a summer day in the delightful Piedmontese lakeside town. Unfortunately she didn't take any photo of the cut cake, so once again I can't show you how it looked inside. But she did say the kids loved it, and she herself found it pretty good. I don't know about you, but these days I feel as if I'm constantly trying to breathe broth. Heat, humidity, and pleanty of sweat - yay summer! Anyway, a colleague - actually one of the attending physicians working with us on a rotation to pamper our beloved policy holders with medical advice whenever needed, or otherwise (Look, mama! More sarcasm!) 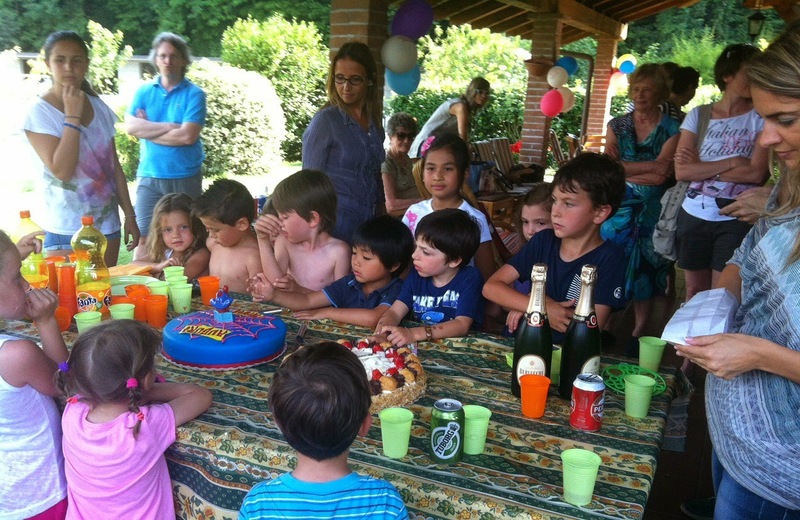 - asked me for a Spider-Man cake for her adopted son Nhat, who just turned six. She wanted it to feed about 20 little ones, but other than that she wasn't particular. 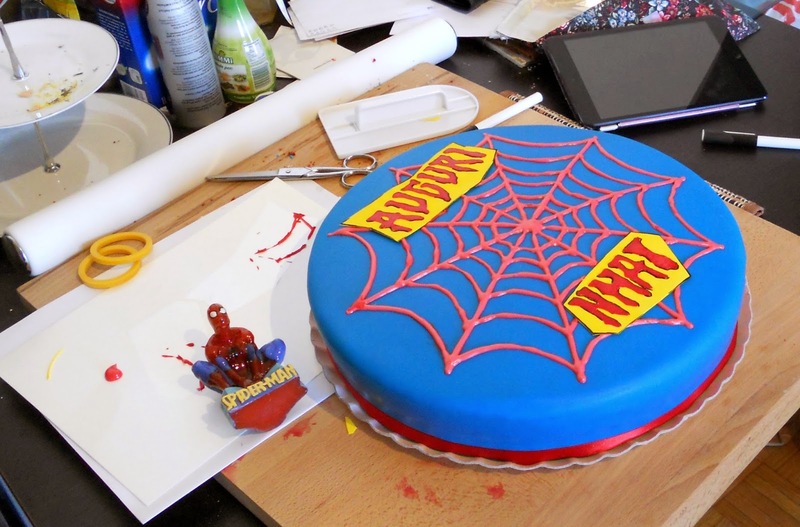 She showed me a model cake, covered with red fondant, with a blue web covering one wedge of it and a Spidey action figure plopped on top. Only she couldn't find that particular toy, but provided me with a Spider-Man candle instead. I immediately thought of repeating my Red Velvet feat from a few days ago, since that cake was really delightful, and dramatic enough to satisfy a bunch of kids. ...and so, here it goes. I thought it better to have the web cover the entire surface, so the kids won't need to fight about who gets to gain a spider sense by eating it. 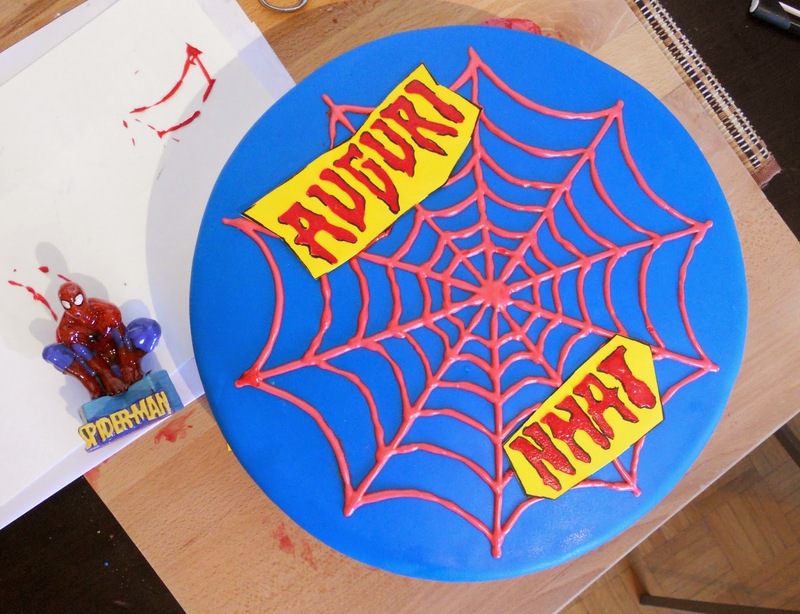 The writing is, likewise, a royal icing transfer, and all in all it was surprisingly quick to do, thanks to this truly amazing Spider-Man font you can download for free OMG! In the end, I picked this one from Food & Wine. Unlike the Bake Happy recipe I used before, this one produces little to no dome, as it is actually meant to bake low, like a German Torte. I wanted a bit more height though, so I made two and stacked 'em - even so, I got zero waste from them, as they baked so amazingly flat I didn't need to cut anything from them. So, alas, a canned vanilla frosting it was, and plain American buttercream for crumbcoating. The very thought sickens me, but this way I'm sure the kiddos will not object... plus, I have to admit the hellish stuff is much stabler than anything dairy-based! Right, now I only need to carry the darn thing to work. Ugh. I don't know which one is weirder - my family wanting to give an American dessert a try, or a rabid foodie like me having somehow overlooked such a pearl as Red Velvet cake. Then, out of the blue, my brother - who's something of a food snob as well, mind you - chimes in: "I wouldn't mind trying Red Velvet cake. I hear it's not super sweet, and more on the tangy side". And now's when I spit out the ugly truth: I myself am not sure how Red Velvet cake is supposed to taste! Because yes, I've had a couple Red Velvet cupcakes in my town but, of course, there is now way I can ascertain how close they were to the real thing. In comes the Internet ofc... and, following some frantic browsing, I got a fairly precise idea of what Red Velvet should look, feel, and taste like. I rounded up the top Google search results, discarded right away those recipes that would have given me anything else than the Platonic idea I had by then formed in my mind, and finally went for one that not only looked spot on, but is from my fave food blogger ever: Aikko of Bake Happy... who is - please allow me to refresh your memory on this point - the very same gal who's responsible for the banana bread I've been making non-stop for more than two years OMG. I could think of no better references, really! 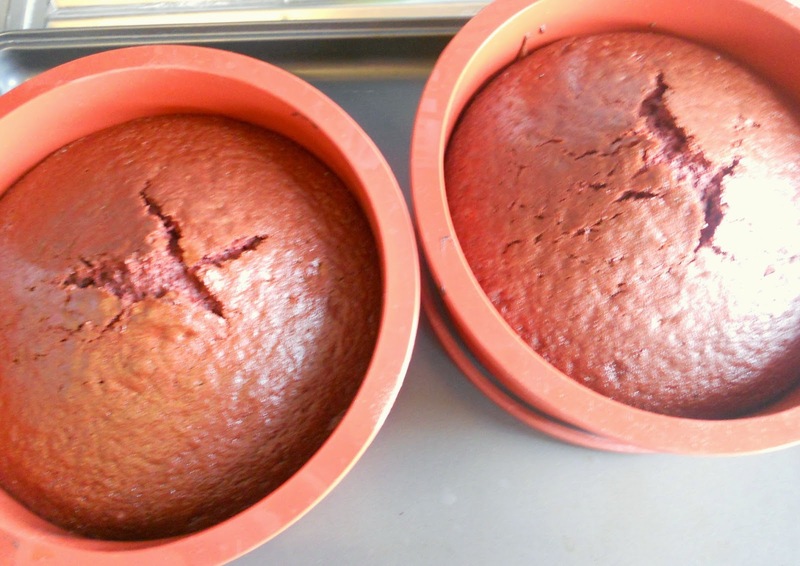 So... go have a look at Aikko's Red VelvIet cake recipe, then hop back here. We have some baking to do! 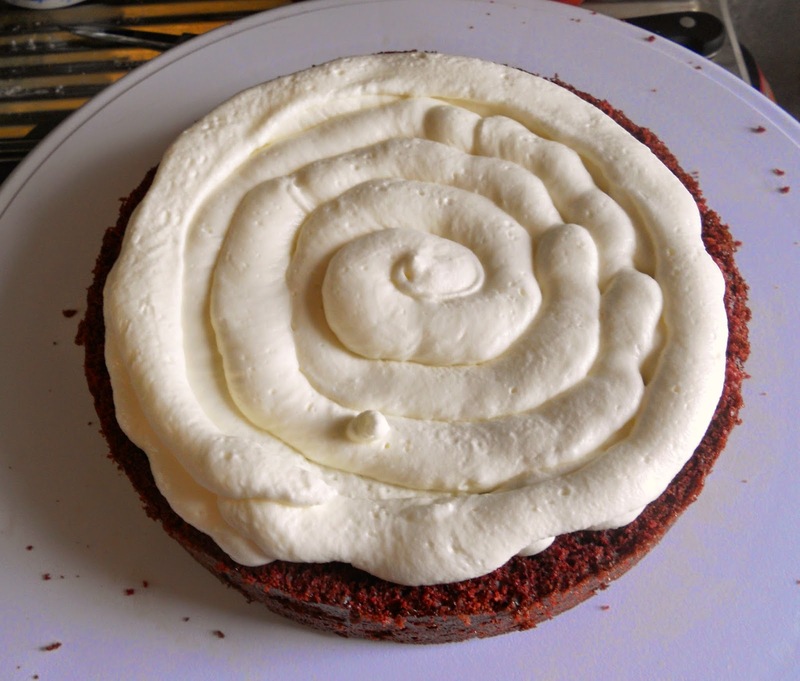 The recipe lists quite a few easily found ingredients you could substitute buttermilk with, but since this is my very first attempt at Red Velvet (and its outcome will shape my view of said cake forever and ever), I went all gung-ho about getting the original stuff. Thus, actual buttermilk it was. 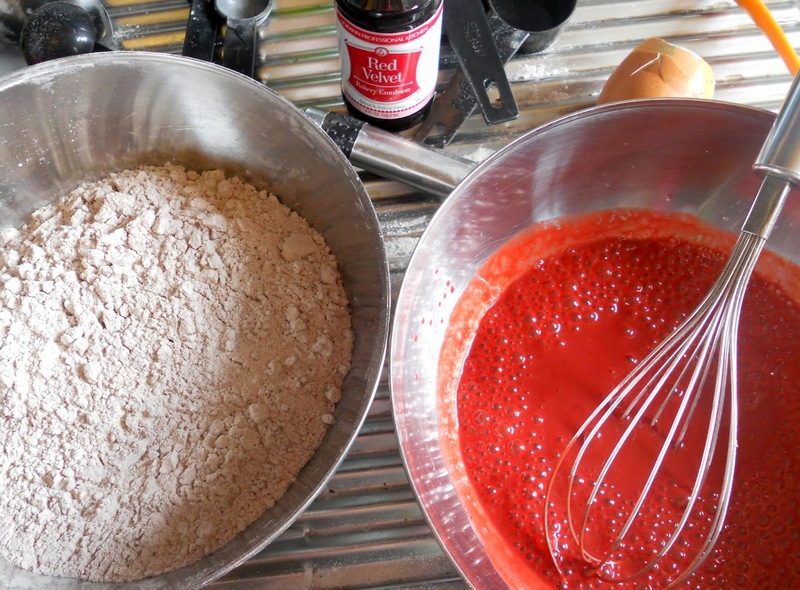 One thing I did my own way, though: I swapped the red food colouring for an equal amount of LorAnn's Red Velvet Bakery Emulsion I had bought online on a whim ages ago, and that had been biding its time in my pantry ever since. It looks like thick, honey-like red gunk... but once whisked into your liquid ingredients, it not only imparts them a beautiful, vibrant red shade, but also acts as flavouring. Good stuff! I got two 6 in. cakes out of the given doses, which was just the perfect size for this. Only as you hopefully can see from the (fuzzy, blurry, smartphone-made) pic above, both of them domed quite much, which meant I had to cut what amounted to more than 1/3 from each base. And yes, of course the scraps won't go to waste, still I think I'll try lowering the oven temperature one notch next time I bake this into silicone moulds. Right. Onward to the filling & frosting step! Notwithstanding the heat, I opted for a traditional cream cheese frosting - because yay authenticity, remember? I know it's nowhere as stable as buttercream (or even cream cheese buttercream) but in the end, my brother wanted tangy, so he's in for the full experience! By the way, I used Austrian Quark as my cream cheese, instead of the ubiquitous Philadelphia... which is creamy and fresh and absolutelt delightful in many ways, but no tangy at all. Again, I've never sampled real cream cheese in America, but judging from online descriptions of its texture and flavour, what I got here must be pretty darn close! Aikko covered her cake with crumbs all over, but I wasn't really sold on the idea. So I simply picked the biggest closed star tip in my collection and piped random rosette-like swirls all over the place. It looks impressive enough IMHO. 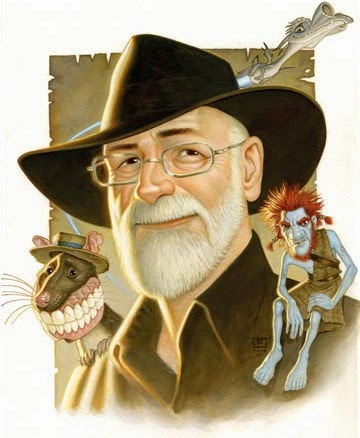 For those who really need to know, Terry Pratchett was born in Buckinghamshire in 1948. He's managed to avoid all interesting jobs authors take in order to look good in this sort of biography. In search for a quiet life he got a job as a Press officer with the Central Electricity Generating Board just after Three Mile Island, which shows the unerring sense of timing. Now a full time writer, he lives in Wiltshire with his wife and daughter. He likes people to buy him banana daiquiris (he knows people don't read author biographies, but feels it might be worth a try). Time for a new Discworld personality to get a cupcake portrait! But, who shall it be? Not a witch. Not a wizard. Not a guard either! ...because honouring the characters is all fine and good, but what about the author himself? And, what better day to do this than his birthday? So I did my fair bit of web-searching, and discovered it is basically a cocktail made with pureed banana, rum, triple sec, and lime juice. Debate is raging on between those who think it is kosher to throw in Crème de Banana liqueur as well, and those who are dead set against it. Also, when pronounced correctly it sounds like "DUCK hairy". True story! So, to make a long story short - I picked what looked like the most widely accepted version of the cocktail and made myself a nice, big glass. All for the sake of research, you know how it is. Alas, much as I wanted to love it, I can't say I did - I'm guessing they add something to the banana puree in fancy pubs, because in its natural state it turns an icky brown in a matter of seconds, even with all the lime juice and alcohol and stuff mixed in. Also, the drink itself... it's not that it tasted bad, but it was thick and heavy and far too sweet. Uh... Sir Pratchett? I love you to pieces, I really do - but, you like yourself some seriously girly cocktail. Sorry, but it's true. Give me a Mojito or Black Russian any day! Now about the cupcake version! You will need ripe bananas for it, although not nearly as squishy as you'd want them to be for banana bread. I found it easier to de-construct the cocktail, by making some seriously banany cupcakes and leaving it to the glaze to convey the booze-and-lime kick. The definite advantage to this approach is that the rum doesn't evaporate in the oven! Even if you, too, find the original cocktail a bit meh, I think I can safely promise you'll love these cupcakes. A kid-friendly version is provided, but honestly... it's just not the same thing, y'know? 2. Sift the flour, salt, and baking soda into a bowl. 3. Cream the butter and sugars (use a stand mixer if possible.) Once they've fluffed up nicely, add in the eggs, one by one. 4. With a fork, whisk the Crème de Banana or banana extract (plus the rum extract, if using) and buttermilk together. 5. Set your stand mixer to its lowest speed, then add the dry ingredients and boozy buttermilk alternately. Pro bakers say you should start and end with the flour mix. 6. 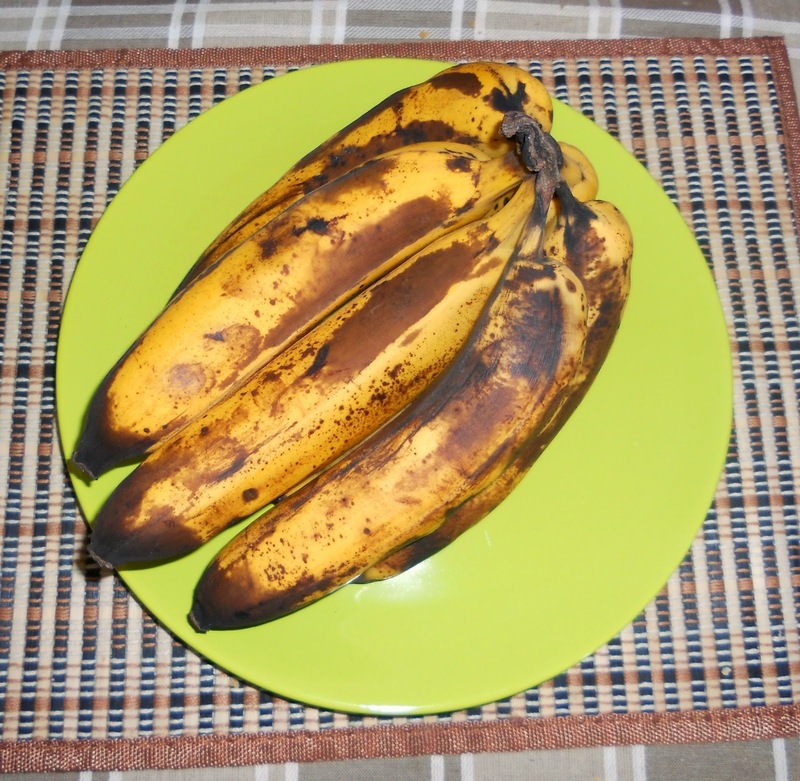 Puree the bananas by throwing them in a blender and pulsing briefly for 2-3 times. Quickly add them into the mixer bowl, so they won't have the time to turn brown on you. 7. 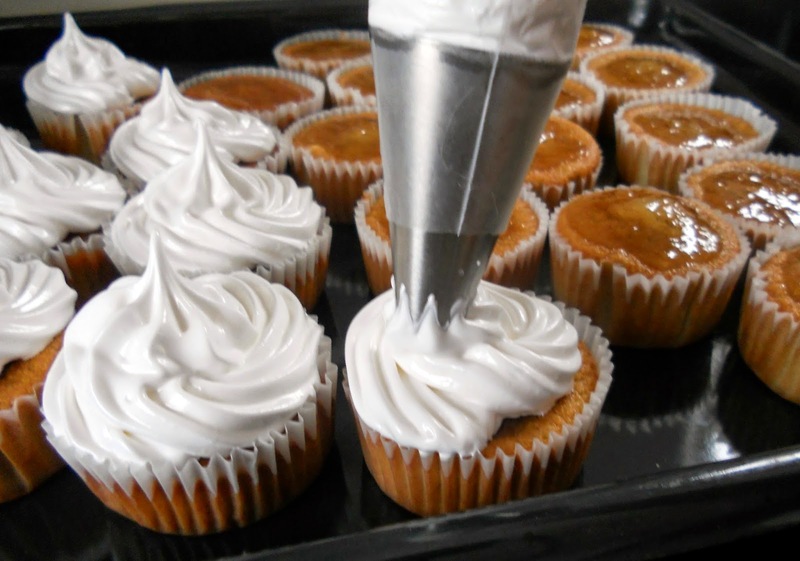 Pour the batter into a cupcakes mold, lined with paper wrappers. 8. Carefully place a water-filled silicon cup on the oven's bottom. 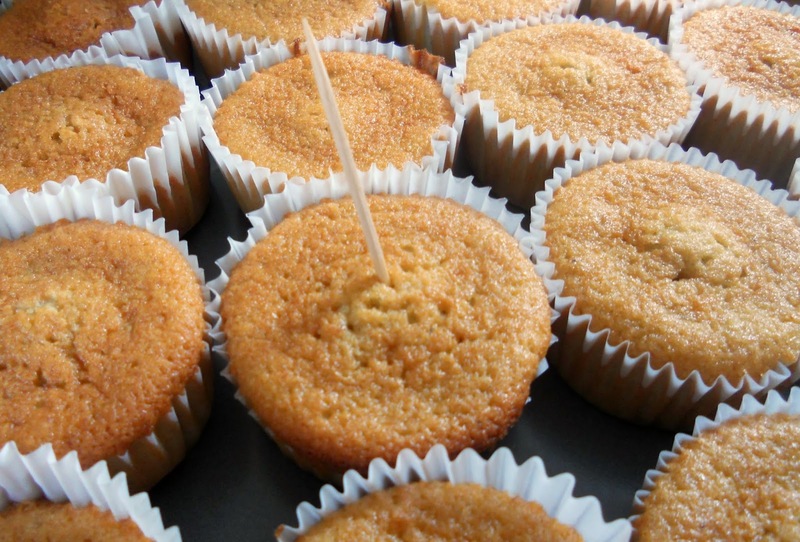 It will slowly evaporate and the humidity will make your cupcakes wonderfully soft and moist! 9. Bake for about 20 minutes. Always test for doneness ofc; every oven is different! 10. Leave the cupcakes in the mold for about 5 minutes before removing them. Proceed to glaze them right away, then - once they have cooled down completely - frost and decorate them! 11. Crack open your favourite Discworld novel. 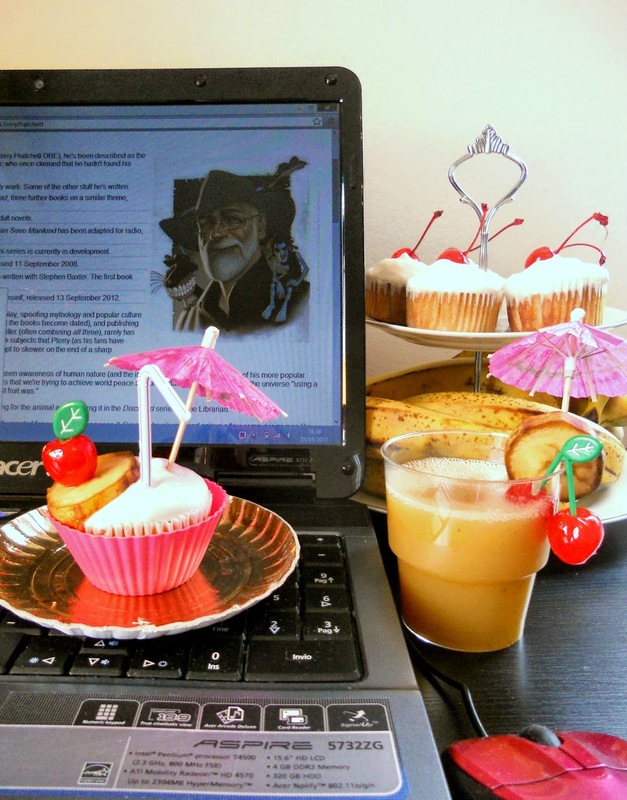 Have a toast to Terry Pratchett. Enjoy your cupcakes while reading away! The glaze is where the serious booze comes into play, so if you're planning to let kids have a cupcake or three, you'll want to skip the alcohol altogether, and maybe add an half teaspoon rum extract to the batter itself. I most definitely do NOT recommend this if you're making them for yourself - it's one of the perks of being an adult! If you can't find it, you can simply make a simple syrup out of rum, lime juice, and sugar or honey. But the marmalade is a treat in itself, so if you can get your dirty paws on a jar, you'll be happy! 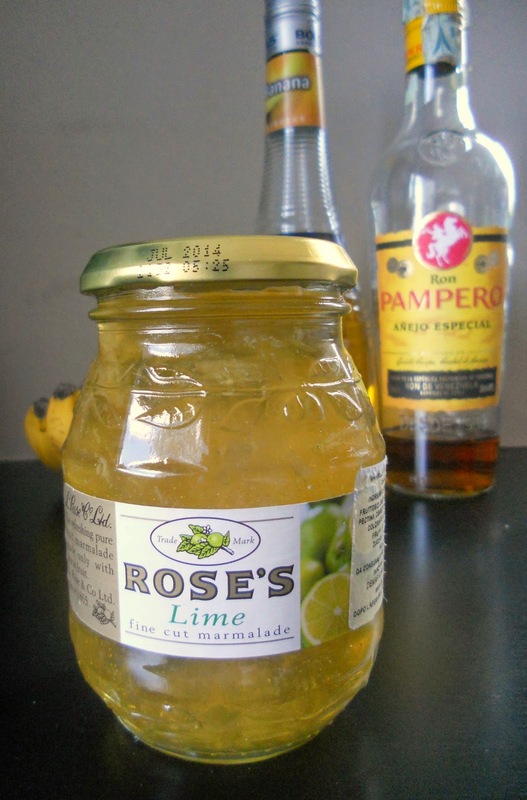 While the cupcakes are baking, pour about 10 Tbsp lime marmalade and 4 Tbsp lime juice in a small saucepan. Heat on low fire, stirring constantly. Turn it off as soon as it starts simmering. ...and pour about 1/2 Tbsp glaze on each. Most of the glaze should seep into the cupcakes - it helps if they're still warm - but it's ok if some of it pools on their top! 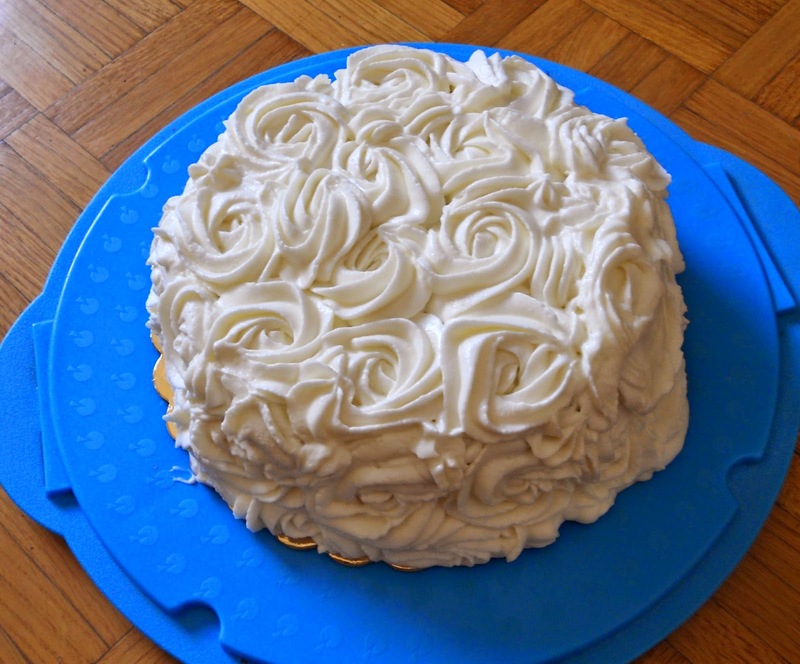 As for the frosting, I didn't want some heavy buttercream, so I went for Martha Stewart's "cloud frosting" (a.k.a. Seven-Minute Frosting), minus the vanilla extract. Her recipe involves egg whites and a candy thermometer (and lots of whisking! 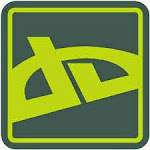 ), yet it 's not difficult to make at all. And it results in a fluffy, creamy frosting which feels indeed cloud-like, and not overhelmingly greasy and sweet. Plus, it's so shiny and pretty when piped into fluffy swirls! Instead of vanilla extract, I put in a few teaspoons more rum and Crème de Banana in my frosting, plus what was left of the lime juice. I'll admit this compromised its stability more than a little, as the icing was very soft and prone to deflating when left at room temperature - yet I think it really helped to tie all the flavous together, and was totally worth it! I wouldn't try keeping the frosted cupcakes for more than 24 hours anyway, and even so, I'd recommend storing them in the fridge. 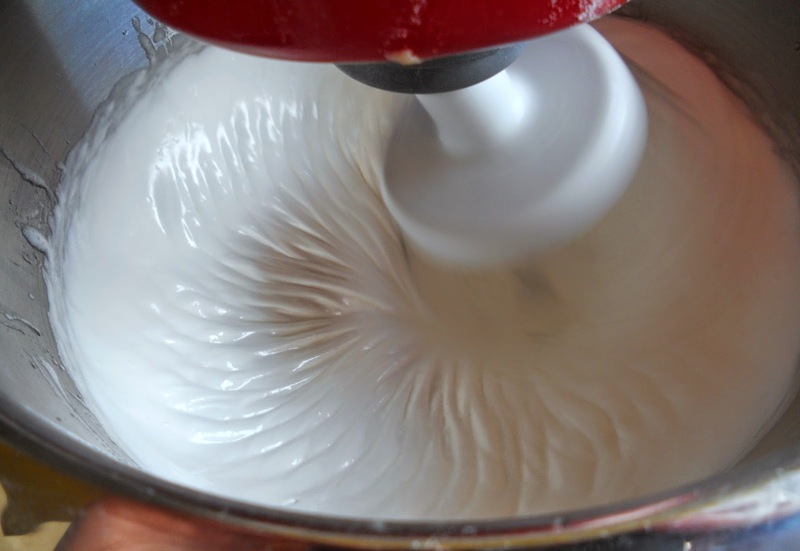 I use pasteurized egg whites for all of my baking but, as they say, better safe than sorry! You can always freeze the baked cupcakes, unglazed and unfrosted, until you're ready to eat them - they'll keep wonderfully that way! These cupcakes are very soft (read this as: they're not simply a banana bread baked into a cupcake mold! ), and since they're well soaked with lime and booze, they're beyond moist - simply irresistible! Also, since they're supposed to mimic a Banana Daiquiri, they don't need much in the way of decoration. Simply stick a paper umbrella and a straw in them, top with a cocktail cherry, and garnish with a thin slice of banana - just like you'd do with the cocktail itself! The Internet is teeming with creativity and enthusiasm. To any blogger out there, this must be a given fact. I know it is to me, and delving into it and embracing its openness - usually in its nerdiest declinations, be it fanart or fanfiction or my very own playgrounds, crafting and baking - is my favourite way to restore my sometimes dwindling love for, and fascination with, people in general. Sure, there's bound to be the occasional riot, usually about a few persistent sore spots such as intellectual property etc. A famous, well-respected creative guru snapping at the online community for no discernible reason is sure to elicit lots of drama, and from time to time the issue of "Internet envy" is resurrected (and discussed ad nauseam) as one "pro" blogger or the other is knocked off the pedestal. We all have our ego and there's no denying that. Still, the blogosphere at large is made of generous, dedicated people who selflessly share their breakthroughs without any thought of getting something in return. As perusers, we easily recognize the effort that goes into developing a recipe from scratch, and admire the creativity of a whole new design or presentation. Such skills may even get the blogger some well-deserved recognition. There are times, though, when a blogger's credit lies in sharing tips, tricks and tutorials. Such contributions won't cause anyone to drop their jaw in wonderment, and most of the times we'd be hard-pressed to remember whom we got them from. Yet their tips we put to use again and again, until we come to recognize that "something I read somewhere on the Internet" made our life much easier. Those people are the real, unsung heroes of the online community, much as good teachers (mind you, the key word here is good) tend to be in the "real" world. Today I'm going to showcase a few instances were a trick I read online taught me a better or easier way to do something. I could list many more ofc, but this is enough for one post! 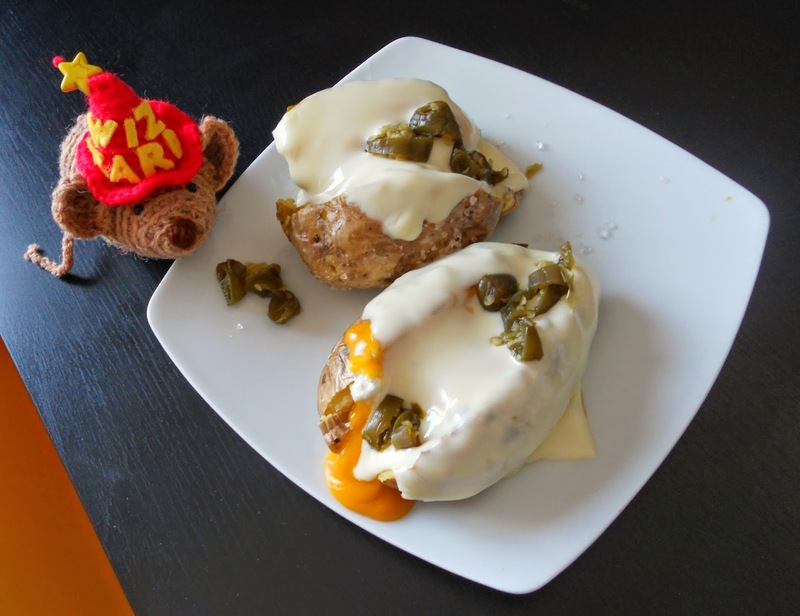 Let's start with my favourite - a comprehensive article about how to bake the perfect potato! Baking potatoes, now, is one of those skills that are usually taken for granted, like roasting a chicken or boiling eggs. Anyone knows how to do it, but oh so few know how to do it well - and the lucky few, they might not even be aware of how big a difference it makes, and how precious their knowledge would be to the rest of us. They'll probably tell you they "do it the usual way" like their Ma used to, and that will be that. Back to our potatoes - the article I linked might sound overkill, but it really takes all the guesswork out of baking them. Thanks to it, my baked potatoes have gone from "good enough" to "simply perfect every single time" - and given my utter love of potatoes, this is saying something! Aaand... it's potatoes again! Seriously, I can't get enough of them! 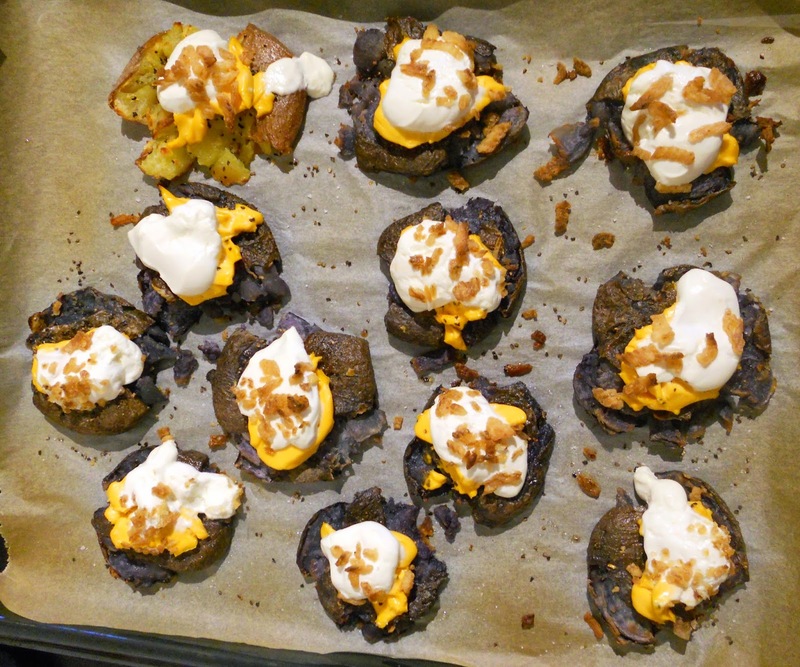 My trip to England back in November did nothing to assuage my baked potatoes obsession, this much I can tell you! Whereas the previous trick works well with huge potatoes that will turn all nice and fluffy in the oven, this one from Closet Cooking is perfect for very small ones, and makes them delightfully crispy. You only need to pick your poison! All but one of the potatoes I used were the purple variety btw, but once boiled they turned a dull grey. They taste every bit as good as the regular ones, but next time I won't bother with the li'l pricey beasts - they're just not worth it! Also, there is no bacon on my potatoes OMG. I must have been out of my mind. But, I sprinkled crunchy fried onion crisps on top. Can we still be friends? Pwetty pwease? For our next awesome tip we move away from potatoes, and on to pizza! Or rather, French bread pizza - three words that most of my fellow Italians wouldn't be able to pronounce without sneering, provided of course that they knew what they mean. I do, as a matter of fact, like it better than regular pizza, which tends to be much of a hit-or-miss thing with me - I'll either love it altogether, or utterly despise it. Here's where the catch is, I guess: I can get crazy demanding before I grant my seal of approval to a regular pizza, whereas all I ask of its French bread-based cousin is for the bread itself not to be all soggy and yukky. Easier said than done, though - one might be lead to believe that a nasty, damp crust is the price to be paid for taking a shortcut instead of making your own dough. Well, no more! Because Mel, a self-professed soggybreadphobe, found out a way to prevent such plague, and was good enough to share it with the world. 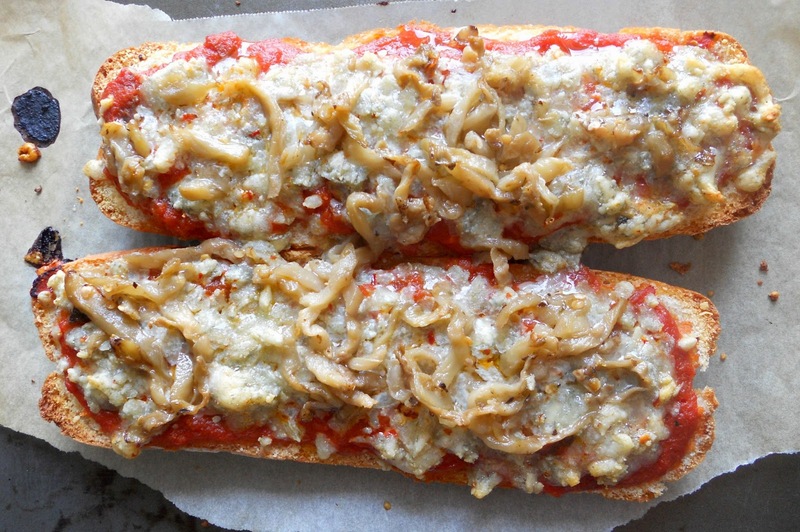 I have made French bread pizza "her way" twice, and it turned out perfect both times! ...while the second time I got a bit lazy (lazier, that is!) and used a storebought tomato/aubergine condiment, which I then rounded up nicely with aged Cheddar cheese and more aubergines in oil. Needless to say, I liked the cheesier one better! Easter is nearly upon us, so this is the perfect time to introduce this awesome guide to stealing candy! Kids everywhere should raise their praise to Jessie Oleson Moore, the CakeSpy's secret identity. Dessert scholar and artist extraordinaire (I should know - I own one of her paintings! HA! ), she has also been an accomplished candy thief since childhood. Who would have guessed? See? No indication of tampering whatsoever! In conscience, though, I'm not sure it is right to teach kids how to steal candy. It is, understand... the ethics of it that I question. 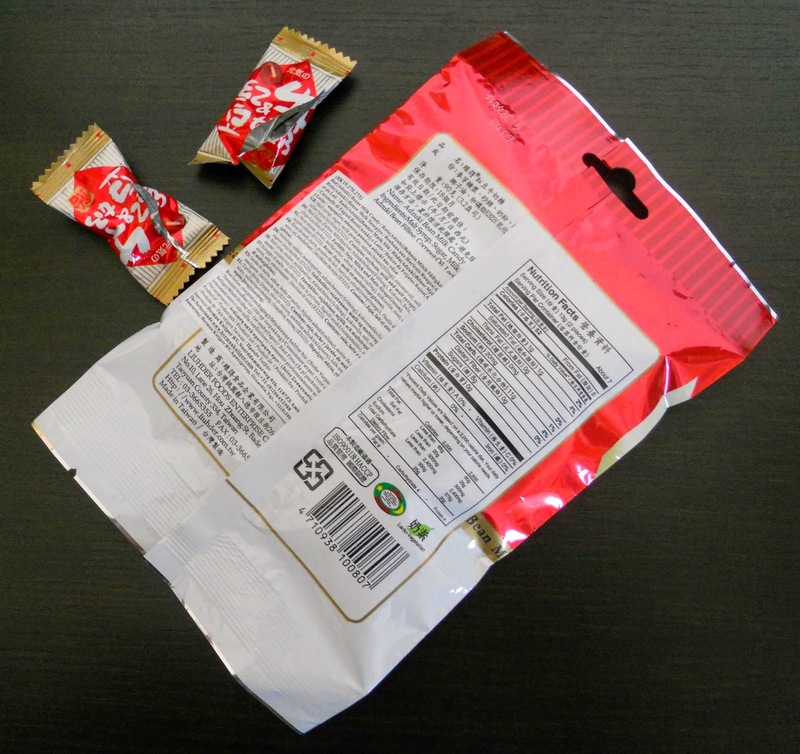 Because frankly, if a kiddo aged six or more needs online tutoring on the matter, he/she simply does not deserve candy. My generation sure needed no such prompting! Why, we were more than capable of coming up with three different plans in a single afternoon! - How to boil eggs perfectly, every time. I stated before it's more easily said than done, but The Kitchn comes to the rescue... time tables and everything! - How to peel bananas like monkeys do. Not much to add, really. Ooooook! DISCLAIMER: I am of course aware that plenty of similar tutorials are popping up on other blogs and on Pinterest. I have no way of knowing which one came first - nor the steam to try and ascertain it, frankly. So while I can in no way guarantee that the ones I linked are THE Ur-posts about each respective topic, this is where I picked the tips up from first, so it is to their authors that I'll be forever grateful for many delicious lunches to come! (*) Now before the International Educators Commitee sends in the thugs, or some righteous mom flames me in the comments: it's called irony, peeps. Give it a try sometimes! It's Gluten-Free Week over at the Kitchen Overlord's place, which was a tough theme for me - I'm neither celiac not gluten-intolerant, thus I've never been overly motivated to research this particular branch of cooking. Closest I ever got was half-heartedly baking a couple things for a colleague who is mildly sensitive to gluten (and doesn't even love sweets that much, I might add), but in those instances I merely bought the outrageously expensive specialty "flour" that comes with starch and metyl cellulose and stuff already mixed in. 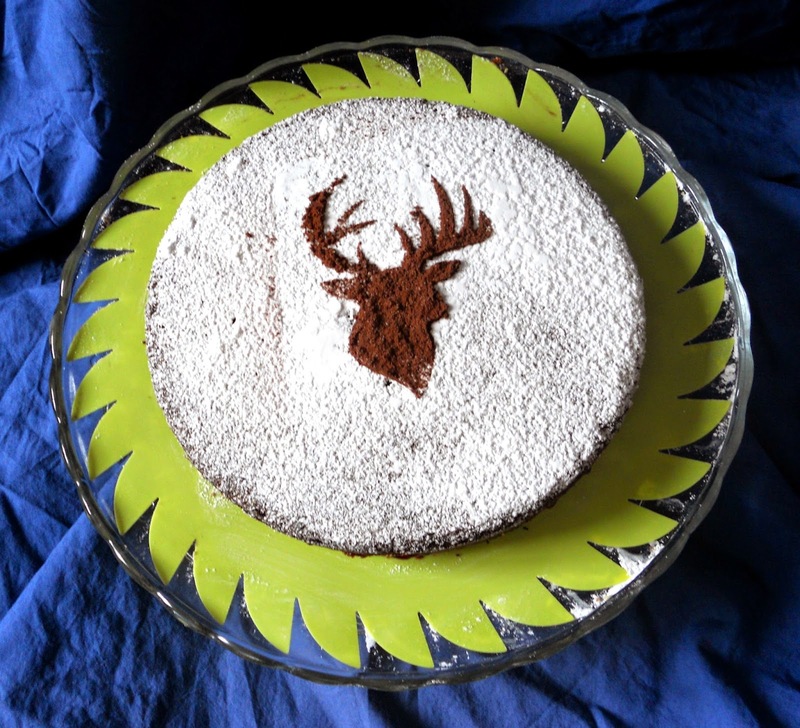 Buckwheat flour, though - it's a waning ingredient, yet it is rooted deep enough in the Italian tradition (in Piedmont especially) that even I have done a bit of experimenting with it in the past. 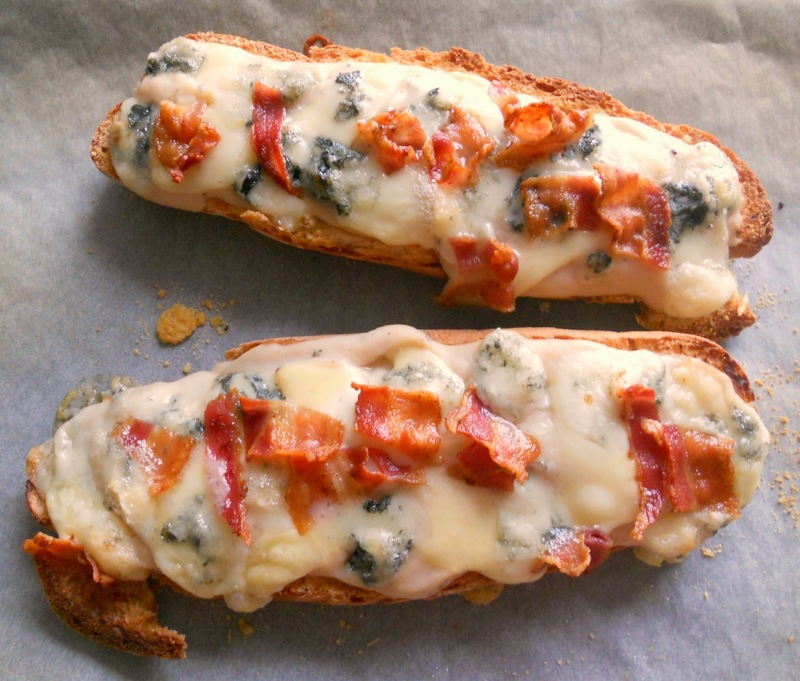 I love it because of its distinctive, very rustic quality - absence of gluten notwithstanding! This cake uses buckwheat as its main "grain", plus almond meal and chopped, toasted almonds for added body and texture. Although whipped egg whites are folded in the batter for a bit more volume, it doesn't rise much - but if you like your cakes dense, hearty and nutty, you'll enjoy it for sure. Even if you're no celiac, I promise! Please head HERE for the full recipe!